Michael Allen is one of the authors you should definitely watch. So far, he has shirked, with grace and panache aplomb, anything in his writing that would even remotely look like mediocrity or being "just" good; and this adventure is no different: What we have here, to put it bluntly, is excellence. The attention to detail and amazing atmosphere, the creative set-pieces that organically flow together, the blending and development of themes – they all fit together so well. It’s weird, really – the adventure is, for all intents and purposes, very technical in its craftsmanship. At the same time, though, it also manages to evoke a sense of atmosphere you only very rarely get to see. In fact, this felt in many instances almost like an OSR-module, with so much care poured into the details, the small bits. There is a subtle, playful artistry in this adventure, one that made me reminisce about Tomb Raider, about some survival movies, about classic dwarven-themed adventures and underworld exploration…but at the same time, the adventure manages to somehow transcend all these diverse influences, weaving them into something distinct, novel and exciting. 57 pages of pure awesome. This adventure includes an additional PDF of all the maps in this adventure, with and without gridlines so you can use these with virtual tabletops or print them out with ease. 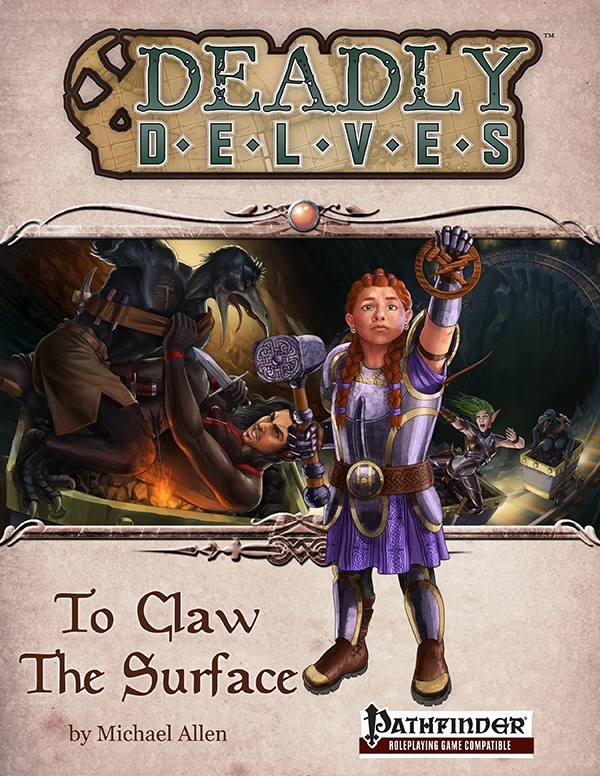 Deadly Delves: To Claw the Surface is available for 30% off right now. This adventure is a great way to start off a campaign, taking starting characters all the way to level 3. Looking to start a new campaign this year? Deadly Delves To Claw the Surface is a great way to start a new campaign. Explorer the depths below a dangerous mountain today. If you have played this adventure, please let us know what you think. Leave a review or post your comments here today. Thank you for taking the time to review I am glad you liked it so much. Deadly Delves: To Claw the Surface takes your level 1 group to level 4. This is one heck of an adventure. Grab it now while it is 75% off the regular price. If you want an amazing 1st level adventure for your game, be sure to check this one out.